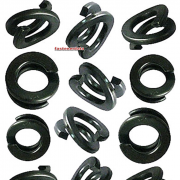 Helical spring lock washers have been historically among the most widely used anti-loosening assembly components on the market. They have been specified in thousands of assembly applications. Called split lock washers in the USA they have developed on both continents. Apply greater bolt tension per unit of applied torque. Provide hardened bearing surfaces to create more uniform torque control. Provide more uniform load distribution through controlled radii. Provide protection against looseness resulting from vibration and corrosion. Optimum locking device for use in applications with hardened faying or bearing surfaces. The “Split” in the helical spring lock washer absorbs initial driving torque and visually closes under nominal bolt loading. When tension in the assembly is reduced and loosening occurs, it provides resistance to the back-off rotation of the screw. Independent tests show that this is just a small part of the helical spring lock washer’s contribution to assembly integrity. Helical washers are trapezoidal in section. After the single-coil spring closes to the flat condition, further loading results in additional deformation of the washer. This further deformation is caused by a complex twisting of the trapezoidal section and a slight increase in the diameter of the washer under load. The spring rate which is developed by the final deformation is very high and provides a reactive load that is equivalent to a significant increase in effective bolt length. Bolts stretch under load. The longer the effective length of the bolt, the more it can stretch. A hardened steel bolt 8.8, when stressed at 60,000 psi, will elongate approximately .002" per inch of effective length. A long bolt can, therefore, be a very effective spring and, like a spring when stretched, it attempts to return to its original length. This applies a clamping or tightening force to the assembly. The clamped components are compressed and, in their inherent effort to expand to their original form, they set up an opposing force. It is these two forces that create the dynamics of a tight assembly. SPRING RATE Two terms are used to define and measure these described forces. One is Spring Rate. The other is equivalent bolt length. Spring Rate is the ratio of load to deflection in the loaded part; it is deflection related to load and is expressed in terms of the amount of load required to achieve specific levels of deflection. The optimum joint performance is obtained when the spring elements in the fastening system have a spring rate which is low enough to assure that any yielding of the joint members in compression will not significantly reduce the designed tensile stress in the fastener. To obtain this optimal condition, the conventional solution is to utilize the spring characteristics of very long bolts. 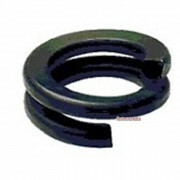 An auxiliary spring element, such as helical spring lock washer, is a very effective alternative. 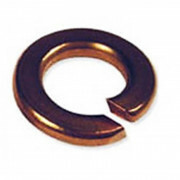 Tests run by Lawrence Technological University have shown that the typical helical spring lock washer exhibits a spring rate after flattening which is approximately 70% more effective than a flat washer of the same thickness. What this means to the design engineer is that the effective bolt length in the joint is increased by the thickness of the flattened helical spring lock washer, plus the equivalent length provided by the spring rate derived from the visually flattened washer. 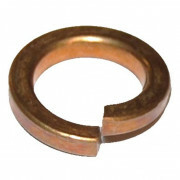 The total contribution of a helical spring lock washer to the integrity of an assembly, in addition to the commonly recognized frictional resistance to back-off rotation, includes the reactive length added to the bolt by the washer thickness and by the tension of Spring Rate generated by its compression. The significant contribution of the helical spring lock washer to the overall tightness of an assembly is best shown in the test results for an assembly without a washer and an assembly that includes a helical spring washer.